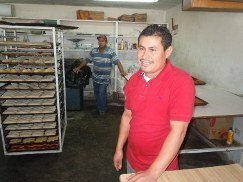 Jesus Brigido has a bakery in Nogales, Mexico. He is originally from Puebla but has lived in Nogales for 27 years. He has been with ProMex Group microfinance project since 2010. His current loan is for US$1,000. He has two employees at his bakery and produces about 6,000 pieces of bread each week. His bakery is part of his home. He used his loan to buy equipment and expand his business. He has three kids and their lives have improved greatly because of the success of his business and ProMex Group.